I love Halloween. I have since my childhood. To me, October 31st heralds the official arrival of fall, long my favorite of all the seasons. The sensory spectacle provided by the annual seasonal transformation in the northeastern United States starting in early October is truly a multi-faceted experience not to be missed; the changing of the leaves, the vivid, warm colors, the crisp and inviting smells, the carnival of sounds, and dont forget football. Whats not to love? And what a holiday this magical season brings. Anything can happen on Halloween. Anyone can show up at your door and challenge you with that ageless phrase, "Trick or treat?" Well, imagine the look on my face last Halloween when Phil Clements, maestro at Clements Loudspeakers, walked through my door with a quizzical smile on his face looking for me. What a conversation we had. I was surprised to learn that back in the late 70s, Clements had been the designer of a little speaker called the Phase Research Model R. He was equally surprised to hear me rattle off a complete description of the thing and its price. Yes, I clearly remembered it as a speaker that performed well above its price point. I still have one of the sales brochures in my files. After about an hours discussion, I had a brief chance to hear a pair of bookshelf speakers, the Clements 107di. With barely a 15-minute audition I was convinced that if these speakers sold for $600 they would be a bargain. I had deliberately guessed a bit low because I expected I was being set up. When Phil told me that these babies went for under $400 a pair, you could have just about knocked me over. I started the arrangements for a formal review right then and there. In mid February, with all the hubbub of the Winter CES behind, products once again began showing up at Chez Weaver. Among the early arrivals were these little guys from Clements. The 107di (the "d" stands for dynamic and the "i" stands for image) is the middle sibling in the di series, with two little brothers each above and below 107dis price point. Nicely finished yet unassuming black boxes, 16.5" tall by 9.5" wide and 11" deep, they were fitted with a pair of typical plastic-nut five-way binding posts. The large 3" diameter port was near the bottom rear of the speaker. Removing the grille revealed the .75" polycarbonate ferrofluid-cooled tweeter and the 6.5" poly-laminate mid-woofer, both of which appear to be of Audax/Polydax lineage. Hmmm. Fairly unassuming again. The grille was attached with four ball-and-socket snaps and was covered with a fairly open-weave black cloth. Although attractive enough in fit and finish for their $390 retail price, with the exception of the ten-year warranty, the speakers appeared to be pretty average. Over a decade ago, Phil Clements read the results of a listening test that changed the way he thought about speaker design. In the study, groups of people were subjected to listening to the same speaker complement with crossovers of varying designs. The speakers cabinet, woofer, tweeter and crossover frequency remained identical, but the slope, or rate, of the crossover point was modified. The speakers were auditioned with 6dB-, 12dB-, 18dB- and 24dB-per-octave filter networks. The results of the test were quite interesting. Unanimously, the panel preferred the first-order 6dB-per-octave crossover, also known as an open-slope design, both in terms of providing a more "natural" sound and a more realistic presentation of the soundstage. The panel then chose, in order of sonic preference, the 18dB, then the 24dB and finally the 12dB crossovers. Im not about to go into all the reasons why these subjective results make sense technically. More interesting is the story of how this one man chose to utilize the results to develop a high-quality yet affordable line of loudspeakers. The desire to use the 6dB network was obvious given its inherent purity and the overwhelming preference among listeners. It is the only filter slope that electrically adds back to, or very near to, "zero" phase shift through the crossover-frequency region without the use of rigorous and destructive compensation. All the other networks impose easily measurable, and as easily audible, amounts of electrical phase shift in comparison to the input signal. Even with careful compensation it is next to impossible to retrieve the high degree of integrity inherent with the single-pole filter. Even though the steep-slope filters tend to corrupt the original input signal by the huge amounts of electrical phase shift they impose, they do have several highly sought-after design benefits. One of the most important of these is the preservation of bandwidth power. Since the steeper-slope filters obviously mean a steeper roll off, certainly much faster than the open-slope design, they provide, with all else being equal, greater overall speaker sensitivity. 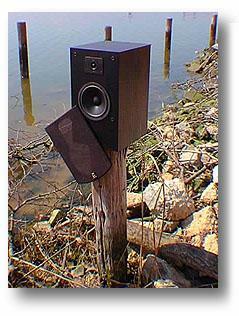 The extended, slowly reducing slope of single-pole filters is typically not a good way to produce a terribly efficient speaker. Check the published sensitivities of other well-known champions of the open-slope crossover design, companies like Celestion, Thiel, Vandersteen, Sonus Faber, and Dunlavy. Their speakers are not known for their efficiency. Other advantages derived from steep-slope filters include greater driver protection and increased detail, both of which are obviously highly desirable. Unfortunately, to gain these desirable results at the price point of the 107di, one typically has to impose high amounts of electrical phase shift. That is exactly what Clements wanted to avoid because it meant compromising the one thing that was paramount in his design goal, signal integrity. So how does one maintain the integrity achievable with a first-order design and still find a way to apply the benefits desirable from the higher-order networks, and do it on a budget if possible? Based on the results of that earlier listening test, Phil decided he would like to see what he could do to impose no more than a single-pole filter electrically. Yet for the sake of greater resolution and dependability, he wanted to try to obtain final acoustical slopes of 18dB per octave, since that was the slope with the second-highest approval rating in the survey. If he could develop a way of combining the single-pole electrical slope for signal integrity along with the power preservation, better dynamics, higher protection capability, greater detail and cleanliness of the steeper slopes, he felt he would have a winner. If only 6dB were available from the electrical filter, a single inductor in this case, then what else could be applied to help add another 12dB and achieve the desired 18dB total? Well, all drivers, at the end of their bandwidths, have an inherent roll-off determined by things like their size, mass, weight, materials, magnetic intensity, etc. Knowing all that, and paying great attention to detail, you could design a driver to roll-off at specific rates. So some, if not all, of the additional slope rate might be achieved by paying close attention to component driver design. This control has to be achieved at a specific rate within a limited acceptable frequency range. If the bandwidth of the driver extends too far in frequency response, then once again, steep electrical slopes would be required to properly knock out unwanted bandwidth. Although many factors must be taken into account, a desired roll-off characteristic can be engineered into a driver. Difficult as this is for one driver, this process becomes exceedingly arduous to control with the addition of multiple drivers, as would be necessary in a two- or three-way design. All the other required design parameters of each different driver to be incorporated into the final design will combine, contribute, and limit certain ways to gain consistent slope rates from the components themselves. Certain slopes at or within the proper bandwidths could be counted on, but not always at the same rate. Now what? This meant that yet a third element needed to be introduced, one that would get the desired overall 18dB-per-octave acoustic slopes with different components of varying characteristics, and do so consistently. This third factor had to be the most variable when applied. The perfect component was an impedance compensation network, which ideally every speaker should utilize anyway. Since all voice coil type drivers exhibit rising impedance caused by the voice coils inductive reactance, one highly desirable purpose of such networks, called "Zobels," is to equalize that rising impedance. This allows for the presentation of a much more friendly and consistent load to the amplifier. Add in that one of its other benefits is its ability to knock out frequency response at different points, variably in slope no less, and youve got the final ingredient in Phil Clements super crossover recipe. I dont believe in critical evaluation of any product right out of the box, and the 107di was no exception. When you audition these guys for yourself, make sure the pair you hear has been well run in. Some of the "edge" begins to disappear after ten hours or so, and at 60 or more hours of play, the speakers begin to show off their stuff. My first audition of these little guys was with my reference rig, and in this system even the interconnects and speaker cables cost more than the speakers under evaluation here. But what did they truly have to say for themselves? This was one sure way to find out. One of my long-time standard evaluation records (thats right, I said record) is my Mobile Fidelity half-speed copy of Supertramps Crime of the Century (Mobile Fidelity 1-005). There is a solo harp (thats a harmonica to those of you who find yourselves blues challenged) in the opening cut playing very deeply at center stage. As the tune progresses, there are numerous voices of children scattered through the very back of the stage covering nearly its entire width. There are a whole host of other things stage left and right at varying depths. The harp was recreated solidly where it belonged in the stage and had a wonderful warmth about it. The voices were placed deeply and accurately throughout the stage, as were the rest of the instruments in this fairly challenging soundstage. Hmmm. These diminutive speakers were beginning to hint at being considerably better than average. I was justly amazed with what these little guys did with any Q-Sound effects they were supplied. Every cue was perfectly located and quite tonally correct. Moving to "Welcome to the Machine" from Pink Floyds Wish You Were Here (Columbia Half Speed HC33453), the weight of the "machine" was pretty convincingly portrayed, if just a bit fat in nature. The ports, a whopping 3" in diameter, start to generate a real breeze around 60Hz and continued to exhibit usable output as low as about 30Hz, though down considerably in terms of sensitivity. And even thought the little ports were moving air at a rate that would be impressive in a small cooling fan, there was no chuff or port noise whatsoever. The piano from the "Fantaisie  Impromptu" on Horowitz: The Last Recording (Sony SK 45818), though presented slightly smaller and more constricted in three-dimensional space, was still nicely conveyed in terms of the warmth, body and the magic of the performance. The timbre and luster of the piano, which is one of the better attempts on CD in my opinion, was presented accurately and with the kind of "involvement" associated with the much higher-priced spreads. With the Seven Years In Tibet soundtrack (Sony SK 60271), the 107dis recreated a nice impression of the heft of the lowest frequencies even though, being bookshelf speakers, they could not truly excavate the nethermost depths of the recording. The glimpse into the soundstage was just a bit shallower than I would like, with a bit more forward presentation than is realistic, but devastatingly insightful. Yo-Yo Mas cello is surprisingly detailed as are the rest of the midrange voices presented here. There is a realistic interpretation of the upper frequencies with just a hint of hardness in the loftiest registers that is almost venial given the ease and vitality imparted through the midrange. OK, but what about the real world? How likely is it that this speaker would be used in a $20,000-plus system? Yeah, thats what I thought youd say. Dropping the speakers into my office system (consisting of a 50Wpc receiver, a portable CD player, and regular old interconnects and loudspeaker cables hitching everything together) seemed to be the logical next step. The results were unreal. Could it be that these speakers sounded even more impressive in this more humble and likely application? Yup. Not that they sounded better here than they had in my reference room, but they sounded as good. They retained all of their attributes, while their shortcomings seemed diminished. I had expected them to shrink when placed in the lesser system. If anything, the level of accomplishment actually grew. They took the system to new heights. Again, the appreciable tonal balance, excellent staging and adroit bass heft delighted me with their unwavering presence. These little speakers are very engaging, rendered a startling glimpse into the soundstage, offered worthy mid-bass performance and had a convincingly neutral tonal balance, even if tilted a bit toward the darker side of neutral. My only complaints were pretty much what you would expect in a speaker selling for twice, maybe even three times, the price of the 107di. From the lower mids up they are a bit on the opaque side of transparency. There is a bit of hardness starting in the upper midrange and going on up, while the midbass is a tad loose and exaggerated. Damnation you say? Far from it. Remember the meager list price. You know, Ive been around this game for about a quarter of a century and I cannot name another loudspeaker manufacturer who puts this much thought and technology into a speaker at this price point. Once you crack the $1000 price range, yeah, maybe you expect to get this kind of design and execution. But at under $400, the Clements 107di is an unheard-of and unbelievable achievement. While it is true that these little guys suffer from the same types of maladies as any inexpensive bookshelf speaker, they do so to a significantly lesser degree than anyone would have any right to expect given their extremely modest selling price. With the Clements 107di, your $400 buys you an extremely well-conceived and well-executed product with tremendous clarity, focus, openness and tonal truth. If your speaker budget is $650 or less, put these $390 standouts at the top of your short list. Monster Cable Sigma Genesis 2000 moving-coil cartridge. A special thanks goes out to Greg for his review of the 107di. Who can explain how sometimes things happen! Here I walk into an audio dealership to make a presentation of my loudspeaker line and end up with a product review. There's Greg, someone I had never met, kindly allowing me to do my dog and pony show, and never saying anything about his association with Soundstage until after the business at hand was said and done. As surprised as I was from that I was equally surprised, as he stated in the review, to hear him talk about some of my original products under the name of Phase Research Corp. originated in the late 70's, which employed patented bass, and later high output ribbon technologies. It is not often I get to exercise a stroll down memory lane about my products and the industry in general. Greg's knowledge, both historical and present, involving the industry is exceptional. It could not have made my day more than to share a few minutes with him about where the industry has come from and where it might be going. Both Greg's knowledge and his love of music evidenced themselves well in his review of the 107di. I was most glad that he not only harnessed his reference $20,000 electronics system to the 107's, which is simply a terrific product, but also took the time to do so with an every day, down to earth basic stereo receiver and CD player, a portable one at that. I believe his observations about such with the 107's are correct. Do you get the exacting detail from a basic receiver and CD player that you would from high quality, high-end electronics? Not really, nor does anyone expect such. I believe in the need for use of such all the time. Irrespective of a speaker's price, an uncomplicated, smooth speaker impedance curve is consistent with obtaining the smoothest electrical phase curve. Experience has taught me that such is a major component for great image, depth, and stage capability in a speaker along with something not mentioned much anymore, the accuracy of such as well. And interestingly, where you need a speaker with the smoothest and least complicated impedance load the most is not with the use of expensive, high tech, beefy power supply amps. While great with such, moreso, it is when the worst or least capable power supplies are used to drive the speaker as is the case with audio receivers. By design they are quite good but compromised in total capability by price and size considerations. So, somewhat ironically, one of my speaker technologies, an impedance compensation network, employed to help pleasure the critical stage, depth, and imaging requirements of the most demanding audiophile is the same technology that happens to be the ideal technology for speakers driven by today's many choices of audio receivers. It is the one speaker technology that greatly contributes, for all the right reasons, to making a typically associated receiver think it is on audiophile steroids. Unfortunately, and perhaps even more ironic is the fact that only a few speaker designers use such technology at any price point, and almost no one in the $1000/pair and under price range. I use impedance compensation networks in all my products along with many other technologies some of which involve the filter network, which Greg has very astutely described. There are presently 14 models in the Clements "di" series all of which range from $225/pair to $999/pair, inclusive of powered subs, center channel models and bipolar surround speakers for sensational home theater complimented by 4 bookshelf and 4 floorstanding models for great musical enjoyment. Every speaker in the line enjoys the same engineering technologies irrespective of price or application. Price is not the common denominator of good loudspeaker design. Caring is. Thanks again to Greg for his comprehensive review of my 107di, and to all the folks at SoundStage! with whom it is always a pleasure to work. I wish everyone the best, and keep up the great work and informative commentary that all of have come to enjoy at SoundStage!